Nordic skiing encompasses all of the free-heel ski disciplines; cross-country (classic and skate, which includes biathlon), telemark, backcountry touring, and, ski jumping. Apart from the obvious link between them of a boot fixed to the ski only at the toe, all these sports are very different in character. Each one has its own appeal and offers its own unique challenges, adventure and fun. 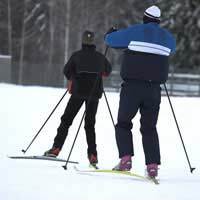 Within cross-country skiing you have two separate techniques, classic and skating. A narrow, light-weight design and absence of metal edges on both classic and skate skis makes them well-suited to speed and distance. They perform better on prepared trails rather than fresh snow, classic skis moving in the parallel tracks cut at the sides of the trail and skate skis moving over the groomed area in the middle. Superb balance, strength and co-ordination of the upper and lower body is required to produce this powerful, yet elegant, rhythmic style of skiing. Skate skiers love speed and power and this sport therefore very much appeals to many athletes from sprinters to tri-athletes and marathon runners. Generally, skate skiers stick to groomed trail systems, unless they can find some hard packed snow. They search out the steep hills to challenge their technique and usually choose 3-5k loops over 10-20k trails. Clad in aerodynamic fabrics and without packs to weight them down, skate athletes focus more on training, technique and speed rather than mileage or scenery. Classic skiers tend to enjoy longer treks on moderately undulating terrain. The technique allows large distances to be covered effortlessly and, even with speeds kept relatively low, anything up to 30k can easily be traveled in a day. Exploring the furthest point of the trail system and enjoying the views along the classic tracks without the weight of a pack attracts these skiers. Scenery is more important than vertical, and miles more than speed. Ski touring takes skiers beyond the constraints of groomed trails and into the backcountry. Slightly wider skis with metal edges allow for more stability and edge control in the varied terrain of the mountains, as well as better flotation in deep snow. This is especially important when touring with a heavy pack. Ski touring requires a degree of previous skiing experience and a certain level of skiing ability in order to tackle the off-piste terrain encountered. Ski tourers tend to be interested in exploration, breathtaking scenery, 'peak bagging' and over-night trips. Exercise is simply an added bonus to these adventurers. Telemarking can be enjoyed both on- and off-piste. Stiffer plastic boots and carving style skis offer better downhill performance as well as excellent flotation in the powder. Telemarkers are as happy on the mogul slopes and the tree-runs of a resort as they are on the untamed slopes of the backcountry wilderness. The more challenging and vertical the terrain, the better! One of the most specialized Nordic disciplines and perhaps the most heart-stopping to watch. This sport is not easily accessible to anyone who feels like just having a go. It is taught only in dedicated academies, to students who have fought off fierce competition for a place. However, most ski slopes now have a funpark with a wide range of jumps where you can try your wings out and get some air under your skis!